Acupuncture for Pregnancy and Heartburn treatments are perhaps one of my favorites to apply, most because the relief is so rapid and my patients have often had and instant reaction with a drop in acidity and discomfort by over half at the end of the first treatment. Heartburn is a very common condition in its own right (and entirely treatable through acupuncture I might add) characterized by a burning acid feeling in the burning sensation which radiates from the mid to upper chest, caused by acidic stomach contents which irritate the unprotected lining of the esophagus, (part of the digestive tract). It is a symptom of a medical condition called Gastroesophygeal Reflex disorder (GERD). Acupuncture for Pregnancy and Heartburn treatment is extremely useful for pregnant women as most will experience heartburn at some stage in their pregnancy. It is most common towards the later stages for reasons I’ll explain in a moment but, it can occur at any stage in the pregnancy, and the severity of the symptoms can range from a simply mild discomfort to severe pain. This can result in a limit of food intake and prevent the expectant mother getting much needed sleep and rest. From a Western Medical understanding the increase in the levels of progesterone and estrogen caused by pregnancy aid in relaxing the smooth muscle of the body and this would include the muscles of the digestive tract, most notably the lower esophageal sphincter, a small circular muscles that opens and closes to receive food. When the muscle becomes loose, stomach acid can flow upwards rather than being contained in the stomach and as a result we have heartburn. It’s also important to keep in mind that during the last few weeks of pregnancy the uterus physically pushes upwards into the diaphragm and stomach, putting unneeded pressure on the digestive organs which only intensifies the problem. Usually the Western Medical procedure is to prescribe antacids, however if a more natural solution can be provided without recourse to medication that is so much better, and Acupuncture for Pregnancy and Heartburn Treatments does just that. From a Traditional Chinese Medical point of view the Stomach is the primary organ affected in Pregnancy induced Heartburn, and is most often diagnosed as Stomach Fire Blazing or food stagnation in the stomach. In the first case of Stomach Fire Blazing (I love the phrases used in TCM diagnosis they are so descriptive – imagine an over active fire in the stomach with flame flicking upwards and how that may correspond to the feeling of heartburn), there will often be an accompanying great thirst and a slight sour taste. In the second case, that of Food Stagnation in the Stomach this is most often as result of certain foods causing an excess of acid to be produced in the stomach which in a volatile and weakened state can rise upwards. This is most often accompanied by feeling overly full, and often there is belching and some small acid regurgitation. Luckily Acupuncture for Pregnancy and Heartburn Treatments can resolve both of these conditions rather quickly and has been proven in numerous studies to be a reliable, safe and effective form of treatment. For example, Dickman R, Schiff E, Holland A, Wright C, Sarela SR, Han B, Fass R., in Aliment Pharmacol Ther. 2007 Nov 15;26(10):1333-44. Epub 2007 Sep 17., conducted a clinical trial on the effects of acupuncture vs a protein pump inhibitor. And found that the acupuncture group demonstrated a significant decrease in the mean daytime heartburn, night-time heartburn and acid regurgitation scores at the end of treatment when compared with baseline. Furthermore a team led by Dr Richard Holloway of the University of Adelaide in Australia reports its findings in a recent issue of the American Journal of Physiology-Gastrointestinal and Liver Physiology. He and his colleagues found that among 14 healthy volunteers, acupoint stimulation reduced sphincter relaxations by 40%. 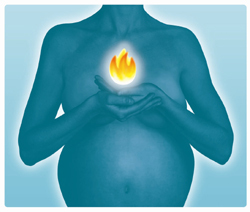 If you are pregnant and suffering from Heartburn, and want to ensure the best possible health for yourself and baby, without medication then perhaps you should consider Acupuncture for Pregnancy and Heartburn Treatments. If you have any questions or concerns regarding the Acupuncture for Pregnancy and Heartburn Treatment protocols that I provide or wish to start a course of treatment then please feel free to contact me or make an appointment where we can discuss any specific concerns or questions you may have.